Malacetic Aural is a multicleanse solution of 2% Acetic and 2% Boric Acid. Containing surfactants, known to promote ear cleansing and drying, Malacetic Aural is unique, 100% natural, environmentally friendly and powerful. Malacetic Aural Solution is effective, gentle and ideal for frequent use. Malacetic Wet Wipes are an apple-fragranced cleansing wipe, ideal for localised washing and disinfecting where shampoo would not reach or be too tricky. Containing 2% Acetic and 2% Boric Acid, these wipes are super strong and can treat and clean difficult to reach areas. 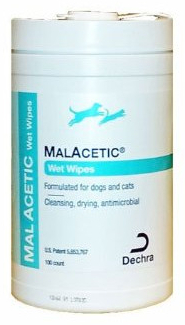 Easy and simple to use, Malacetic Wet Wipes are perfect for cleaning skin folds, particularly in Shar Pei-like breeds. Below are some recent questions we've received regarding Malacetic for Dogs & Cats, including answers from our team. These wipes should be ideal for wiping around the ears and in skin folds near the nose etc. They are safe and non-irritant, while being effective at cleaning with an anti-septic effect. Is this solution only for dogs, or can it be used also on cats? Can it be used with Otodine? Malacetic can be used on cats and other pets too, it is a very mild product. It can be used with Otodine but not at the same time. You should not need to however as the Malacetic should clean the ear itself, but you can alternate the products if you find this works better.